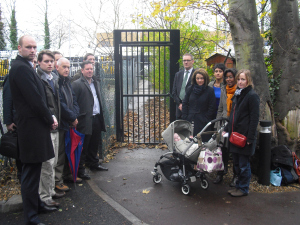 The fiasco of the locked gate between Maze Hill station and Seren Park, the housing development to the south of the station which residents started moving into in 2009, is finally over. 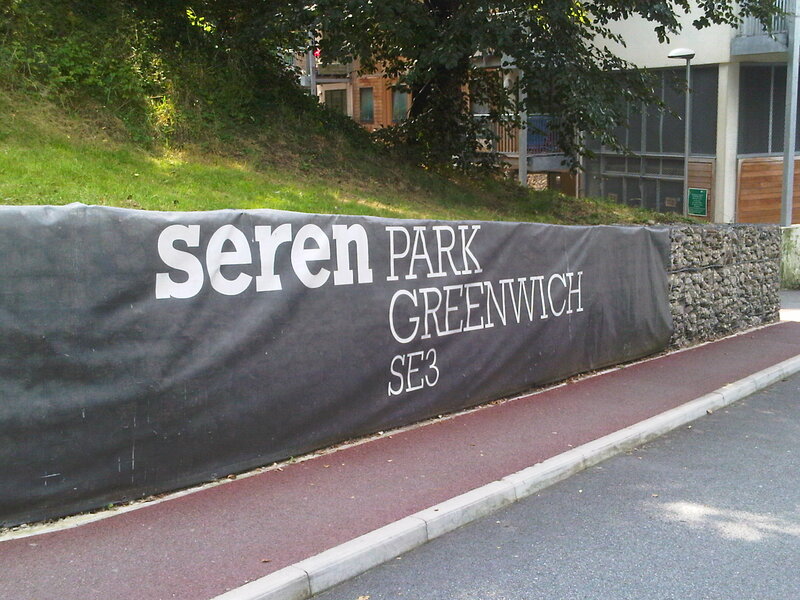 When residents first bought or rented flats at Seren Park, they were promised “direct access” to the station. But thanks to railway bureaucracy and inaction from the developer, the gate remained locked for four years (see here and here for previous posts on the saga) – until now. 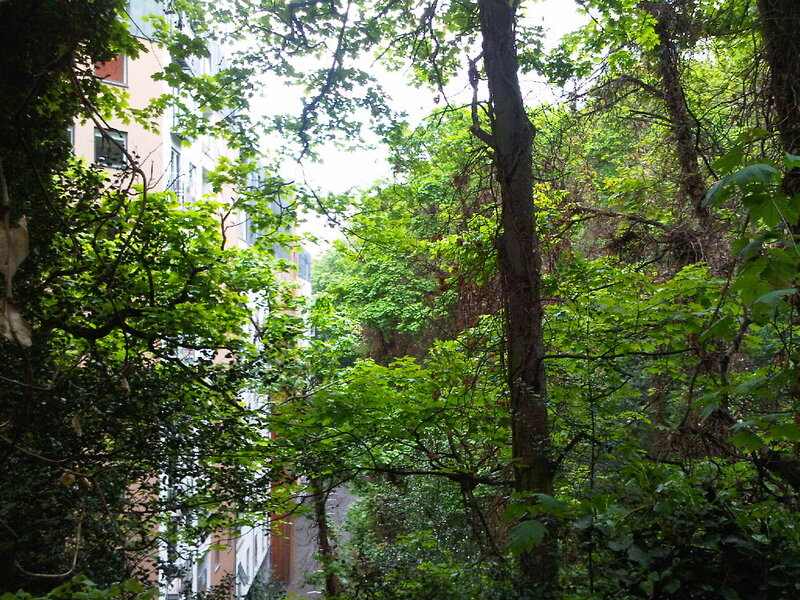 Who knows that there are several acres of woodlands between Vanbrugh Hill and Maze Hill, just south of Maze Hill station? This bank of trees on the hill can be clearly seen from the station, and from pretty much anywhere in East Greenwich looking southwards. But rarely have the newly-christened Westcombe Woodlands (which have been owned by the Blackheath Preservation Trust for many years to save them from development) been opened to the public. Now is your chance to come and have a look – the Friends of the Westcombe Woodlands are having an open day on Saturday June 16th. How long does it take to remove a padlock on a gate? At Maze Hill station it is taking three years and counting. That is how long it has taken residents of Seren Park (the new development on the south side of the railway) to get the direct access to Maze Hill station they were promised when they rented or bought their flats. The delay is causing huge frustration to the residents of Seren Park, who have to walk on a long detour via Vanbrugh Hill to get to a station platform just a few feet from their block of flats. 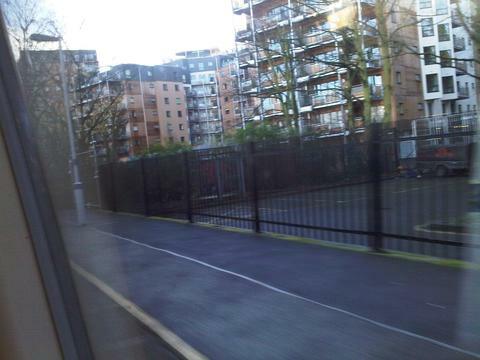 It has also caused problems for residents of Tom Smith Close next door, who have seen holes appear in their fence and are not used to their cul-de-sac being used as short cut to the station. Residents of Seren Park (the new development on the south side of Maze Hill station) and residents of Woodland Heights (the former nurses’ home on the corner of Vanbrugh Hill and Restell Close) held a photocall this morning, December 1st, to urge Network Rail and the developer to see sense and open the path to the Station that they were promised several years ago. One of the most useful things to do as a councillor is to go and see a problem for yourself, rather than rely on what you are being told. In particular it is always instructive to go back to a new housing development once it has been occupied, and compare the reality with the glossy CGIs that were shown to the planning committee when planning permission was given, and see what lessons can be learnt. Two weeks ago I went to meet some residents at Leamington Court, a “new” block just off Vanbrugh Hill (though it is actually an old block from he early 1970s which has been reclad and remodelled, with a new timber facade). The block was given planning permission about four years ago but building work only finished about a year ago. In many ways it is a good development, with a mix of affordable rented homes and shared-ownership homes for those on higher incomes in Leamington Court. A larger block next door (not yet completed) is largely private flats, but there are also some affordable homes in there too. The overall development is called Seren park (Seren is Welsh for ‘star’, apparently ) and is just to the south of Maze Hill station – the best way to have a good gander is from a passing train. Along with other labour councillors, I have been pushing the railways for several years to get a proper gate from the new development onto Maze Hill station, to avoid the big detour via the Vanbrugh Hill footbridge. Progress has been promised soon, but the residents I met two weeks ago had more immediate concerns. Why is it that brand new housing so often has snagging problems? The block is fairly clean inside and many of the flats have great views over Greenwich, and London beyond. But there was a two-day period two weeks ago when residents had no hot water. Due to a malfunctioning fire safety system, several floors had an irritating alarm beeping away 24 hours a day on the landings when I first went to visit. There is also a general perception that the block has needed a lot of repairs since it was built, and these have not always been carried out to a high standard. Moat, the housing association concerned, has to its credit promised to deal with the problems quickly and when I visited block again with David and Pat last week the hot water was working again and the beeping alarm had stopped. I hope the more deep-rooted problems get sorted out soon, as this block should be a great place to live in for both the tenants and those in the shared ownership flats. We will be keeping a close watch and maintaining pressure on Moat if needed.